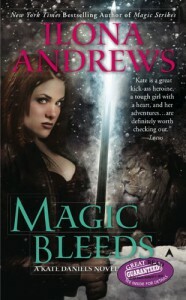 I think Magic Bleeds, the fourth novel in the Kate Daniels series, is my favorite. I loved everything about this book. The story, the characters, the mythology, the action. All of it combined to make a novel that was hard to put down! Kate Daniels is probably my favorite female protagonist. She is fierce and strong. She knows her own mind and she isn't afraid to speak it. She is smart and independent. She is funny and brave and everything I want to be. All of these things make her the kind of person that won't back down from a fight when it is for something she believes in. And that is truly the premise of the novel. She finds herself fighting the battle of her life and it forces life-changing decisions on her, decisions she never dreamt she would be in a position to have to make. This story, while just as full of action as the others, felt somehow more personal. 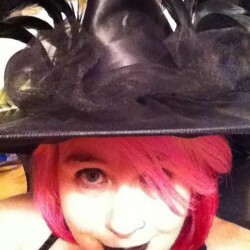 Kate has spent a lifetime avoiding personal relationships, whether romantic or friendships. But there comes a time when those things develop and now she has to make the worst kinds of choices. A lot of questions are answered in this book, but by no means is the story over! !